Oracle has introduced an iPad app that will allow users to access their Oracle virtual desktops, the company announced Wednesday. The Oracle Virtual Desktop Client app, available for free from Apple’s iTunes App Store, allows uses to connect to virtual desktops managed either by Oracle’s Sun Ray Software and Oracle Virtual Desktop Infrastructure. With the software, users can run the enterprise applications they typically run from their virtual desktops, such as Oracle’s Siebel CRM. They can also run applications that require browsers. 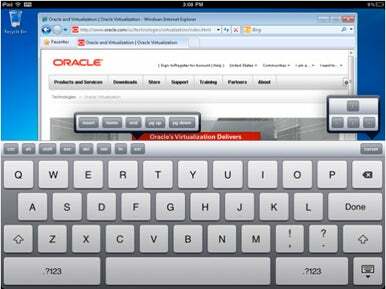 Oracle has also updated its underlying Virtual Desktop Infrastructure (VDI) package. Oracle VDI 3.3 can now use Oracle Linux as a host platform, in addition to Oracle Solaris platform. Oracle Linux is based off of Red Hat Enterprise Linux (RHEL) distribution. The new release addresses many of the typical issues that bedevil VDI deployments, such as sluggish performance, limited functionality and incomplete multimedia support. The model for I/O (input/output) had been redesigned to increase responsiveness for users. In terms of multimedia support, VDI 3.3 supports Windows Media Player and real-time audio streaming through USB headsets. Oracle deployed Sun Microsystems Appliance Link Protocol (ALP) to improves audio quality and cut network bandwidth requirements by up to 92 percent. On the management side, the administration portal has been updated so it now supports role-based access control. It prevents any one user from using too many system resources. VDI 3.3 can now host 100,000 users per VDI cluster, and multiple clusters can run as a single catalog. It also has a new “kiosk mode,” which provides access to a full-screen application, such as a Web browser, and no access to the underlying OS.